We all know that stress negatively impacts our lives. It causes sleep problems and problems with overall health. Minimizing stress, increasing focus and brain power, and improving overall well-being are worthy goals most of us aspire to. Unfortunately, busy lives take precedence, and often there is minimal time available for self-care. Ennora’s soundtracks do the hard work of self-care for you. All you have to do is listen to the binaural beats provided and you can reap the benefits of lowered stress and increased well-being. Bettering your focus at work or increasing your creativity may also mean that you find increased time to do the things you love and take care of yourself in other ways as well. Ennora.com alters the brainwave frequencies it sends based on your desired state of mind. It does this through the use of binaural beats. Your brain is trained to account for differences in noises you hear, so when similar beats are provided to your brain at slightly different frequencies, your brain perceives the difference in the frequencies as a continual reverberation. It is this third frequency, created by your brain, which alters your brain waves. The size of the frequency difference creates different types of brain waves. By manipulating these brain waves, the products on Ennora.com are able to adjust your state of mind. All you have to do is choose which soundtrack or set of soundtracks you want to download, purchase them, and download them onto your computer or mobile device. Because the work happens based on the different frequencies entering each ear, you are required to listen to the soundtracks through headphones to get the full benefits. Each individual track contains 30-minutes of soothing music which will train your mind to enter one of four brain states. Each state of mind offers a different effect on your brain, and the slightly different musical tones allow the binaural beats to be effective at many things, from higher quality sleep to astral projection. Ennora also offers several packs with multiple 30-minute files included, including a Super Pack with 12 files included. The binaural beats offered on Ennora are perfect for anyone who wants to achieve the results of meditation and self-care but doesn’t have time in their schedule to dedicate to it. Because the only necessity of Ennora products is listening with headphones, it can easily be adapted for use during a long commute to work, or even at your desk. There are many benefits to the products offered on Ennora. The binaural beats help reduce stress and anxiety, increase focus and productivity, improve sleep, and heighten spiritual consciousness. Each of these effects leads to better overall health and well-being. Each soundtrack lasts about 30 minutes. One of the great things about Ennora is that the products can be used at specific times–for example, to increase focus during finals week–or they can be used on a day-to-day basis to help with overall well-being. However, the recommendation is that new users listen to a minimum of 2 tracks per day for a period of 7-14 days to get their brains used to the effects of binaural beats. Binaural beats have been shown to be effective, with over forty years of scientific data backing them up. The reviews on Ennora.com agree: The soundtracks are shown to be effective for the users. Cody – I’ve dabbled in binaural beats for a few years now, researched the science with extensive interest, and I gotta say, your product is brilliantly refined in comparison. Keep up the excellent work, and I hope you come out with a new track in the near future. James – Just listened to the free sample. No joking just a few seconds into the track i had to sit back in the chair, it’s so powerful. I have been listing to binaurals for some time and nothing has ever had such a powerfully quick effect. My main area of interest is astral projection. I have been projecting since i was 5 ( i am 52 now) never been able to control it. When listing to the sample i felt my self get deeply relaxed very quickly and felt movement in the astral body. I know the sample is not from the astral projection cd, but energy (thought ) follows intention. I will buy the Astral projection cd as soon as i can. Thank you for the free sample and for such a powerful and effective product. Each individual 30-minute audio file costs $9.99, while the multi-packs range from $25-$50. If you buy a single audio file and find that you regret not purchasing a multi-pack, you can send an email and request to pay the purchase price of the multi pack less what you’ve already paid for the single file. Although we’d love to see a larger library on Ennora over time, and perhaps additional products such as reading material for users, overall Ennora has one of the best websites we’ve seen. 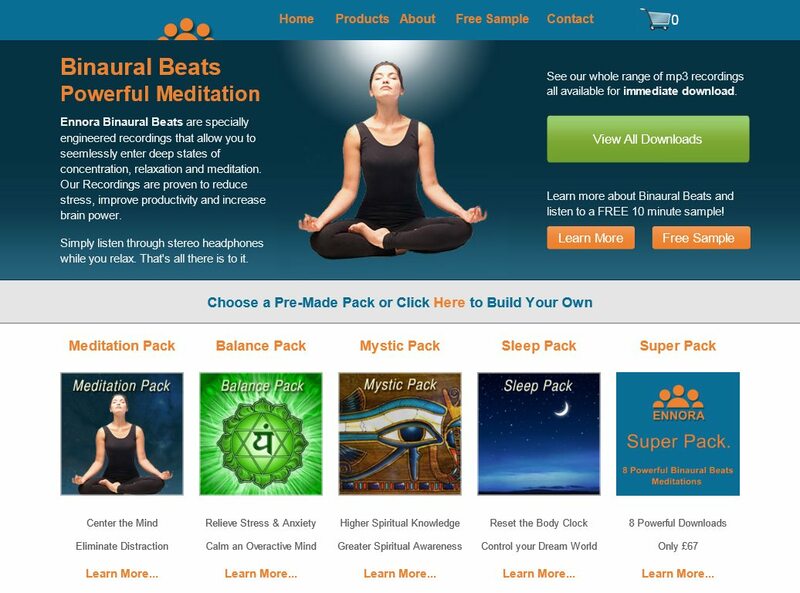 The site itself is easy to navigate, and the How It Works section clearly outlines the science behind Binaural Beats in everyday, easy-to-read language. It’s clear from a single view of the site that the creators care about their products and about their customers.